An Evening with Child Advocates is a free event held for the first time this year at Marian, Inc. The event features a poetry & art contest for children in foster care. This evening is a very special way to celebrate the artistic talents of the children represented by Child Advocates. Download sponsorship form for this event here. This will be Child Advocates 5th running of the Superhero 5k plus 1 mile race for children and families. 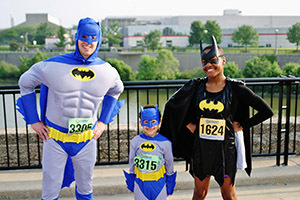 At the Superhero run, participants are encouraged to dress as their favorite superheroes. Coming June 1, 2019. 5k with an 8:30am start time and 1 mile to immediately follow. Download sponsorship form for this event here. Child Advocates will partner with DCS, Children’s Bureau and Choices to provide the Kids Fair which is a free event hosted at Mainscape Parking lot. Hundreds of children from Marion County will enjoy a day of games, fun, and free backpacks for school! Download sponsorship form for this event here. Gather a group of friends and join Child Advocates for our first ever Trivia Night! This inquisitive event will be held downtown at Marian, Inc. Put on your thinking caps and join us for a night of fun all while helping children in need. Download the sponsorship form for this event here. Join us & The People’s Institute for Survival and Beyond for the next Undoing Racism Workshop. The People’s Institute for Survival and Beyond focuses on understanding what racism is, where it comes from, how it functions, why it persists and how it can be undone. Come learn and experience with us.